Do not wait to be fired from your current job before you start your own business. It is my aim to try and persuade anyone who comes here and you have entrepreneurial instincts to unleash them without any further delay. Everything I write about in this E-book I did not learn it in the beginning. That is the sad part. I did not literally learn how to start a business from a business school. I have learnt by taking actions and from mentors. I have been documenting every lesson I have learnt from my entrepreneurship journey (five years) wishing one day I will share it with the world. This is the time. I my e-book I talk about how to start a profitable business from Zero. I will put some Tips here. 1. Create a business idea laboratory. Avoid a common mistake we all make at the beginning coming up with one idea. You need to create a laboratory where you have different ideas not an idea and choose the best idea for you and the one you can start with your current situation. I mean with little skills and funds you have right now. In my e-book I will show you how to create a laboratory and how to choose the best idea. 2. You should be very impatient to start your business idea once you choose the best from your laboratory but you have to be patience once you start. Many people are very patient (procrastinate) to start their idea and once they start they are impatient. In this e-book I talk about speed. You should be very impatient to start but once you start you should learn how to hold in. I will show you skills you need to learn to keep in even when you are not seeing results at the beginning. That is normal for all businesses. But how do you keep in there? 3. Do you raise money from the investors? My answer is No especially when you are just starting. You are in the prototype stage you need to have a lit bit of revenue coming in and at least know you can acquire some customers. You need not to burn all the investors money before you hit on to an experiment which works. So the question is how do you start your business with the little funds you have. I will show you how to break your funds and start with the little you have. 4. How technologically advanced do you need to be? If you are a bible reader, you are familiar with the story about Noah's ark. When everyone was asked to enter into the ark and what happened next. It is what is coming next in our generation and this time it is "technological ark". All businesses are going to be internet businesses. So you should be tech savvy. The question is, are you ready for this revolutionary change? Whether you want to start a restaurant, fitness brand, finance or real estate. At the end of the day you are going to have to know some level of internet skills. Which skills do you need? In this e-book I talk about the tools and skills you need to stay relevant. 5. Do you need a mentor? In my opinion you need one. You need some one who is going to show you shortcuts which work. A mentor will push you through storms. I this e-book I will show you how to choose mentors and three main question you should ask your mentors. 6. How can you beat competition? For everyone you have not started a business yet and for those who are just starting we fear competition. Whenever we think of starting a business we think of a competitor next door. No need to worry. There is one thing I have learnt from beating my competitors. Uniqueness. Find what is unique about your business and let everyone know that. In this e-book I talk about 5 steps how you can find that one thing which will make your business unique. 7. Customers are not motivated by your products. No one wants to buy from you, no one wants to buy from me either. Customers are motivated by stories around your products, brands and services. Learn how to create stories which touch customers’ hearts. If you touch their hearts you will have created a life time customer. 8. Every one has their fear. To starting a business. 1. Many people do not know where to start from. 2. Many are scared because they are not experts, may be at marketing. 3. Many are scared because they do not have enough funds. 4. May be they think no one will believe in them. 5. Many are scared of how to approach customers. 6. Majority are scared of failing. 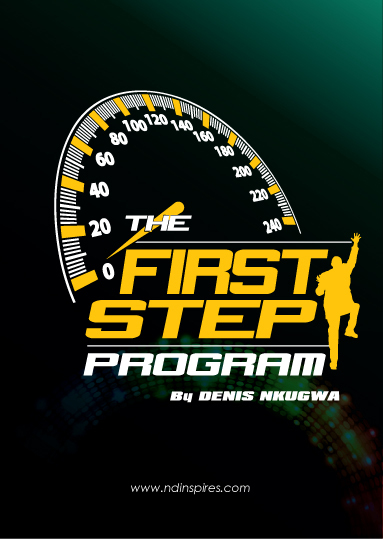 The first step program e-book covers all these fears with practical activities how to overcome your fear. One thing you should know everyone has fear. You just need a reason to face your fear. You should fear not to starting than fearing to fail. This e-book applies to you if you have never started a business whether you want a home business or you want to build something huge. What is inside The first step program? Chapter 2: How bad do you want to be successful? Chapter 3: Start your dream Part 2. Chapter 6: Consistency wins the race. Chapter 7: Building a business step by step. Chapter 8: How to deal with negativity. Chapter 9: Crap attracts crap. Chapter 10: Creating a truly unique business. Chapter 11: Finding your perfect business opportunity. Chapter 12: Taking calculated risks. Chapter 14: Managing your startup time. Chapter 15: Avoiding average mistakes. Chapter 16: Mentors and Mentorship. Chapter 17: Questions to ask before you start. Chapter 22: How to get your first buyer. Chapter 23: Educate first, sell second. Chapter 24: The future of business and technology. Chapter 25: Pitching your idea. Chapter 29: Learning from others. Chapter 30: You are ready to Go.